Cheap Trick usually is mentioned first when the phrase “Midwestern power pop” is thrown around. And rightly so. Tonight, though, we have a somewhat more obscure, but no less tasty sampling of Midwestern power pop for you. The Elvis Brothers — Rob, Graham and Brad — came out of Champaign, Ill., in 1981. They made a name for themselves in the early ’80s on the Midwest college and club circuit, playing early Elvis covers and their own songs. With Rob on lead guitar and vocals, Graham on bass and vocals and Brad on the stand-up drum kit, the lads put on legendarily good-natured and energetic shows. Those shows deftly mixed original, Beatlesque pop and early Elvis-era rockabilly. Graham Elvis offers some entertaining stories from their touring days in the notes about “Analog 88,” his 2006 solo release. One remarkable show — an opening set for the Clash at the Aragon Ballroom in Chicago during the Combat Rock tour — drew the attention of Cheap Trick manager Ken Adamany. So, of course, the Elvis Brothers started touring in support of Cheap Trick. Adamany also helped get them a record deal with CBS’ Portrait label. In 1983, they debuted with “Movin’ Up.” Side 1, which we have for you tonight, is as bright, as energetic, as charming, as good as power pop got in the early ’80s. It received good reviews, radio airplay and some MTV exposure. The Elvis Brothers did those two albums on Portrait — the other was “Adventure Time” in 1985 — and then an indie release, “Now Dig This,” in 1992. That was it. I have only the debut album, but it’s a good memory from that time. I played it often. Give it a spin, and maybe you’ll dig it, too. “(I Know You) Shake It,” “It’s So Hard,” “Hidden in a Heartbeat,” “Hey Tina,” “Red Dress” and “Fire in the City,” the Elvis Brothers, from “Movin’ Up,” 1983. It runs 18:26. “Movin’ Up” is out of print. Both of the Portrait albums were released on one CD in 1995, but that also is out of print. 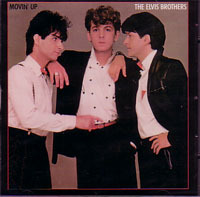 Six of the 12 cuts on “Movin’ Up” are available on “The Graham Elvis Brothers,” a 2007 release. I hit the used record store the other day, but I was on the clock. I was traveling with my dad, who doesn’t get around all that well. Fortunately, it was a sunny winter day, and he was cool with waiting in the car while I ducked into the Book Cellar for a few minutes to check out the vinyl in the basement. The great thing about the Book Cellar is that it’s well organized by genre and most everything is in alphabetical order. So I went right to the soul/R&B/funk and started digging. 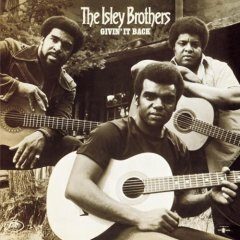 I came up with “Givin’ It Back,” by the Isley Brothers, a 1971 album of covers. Most of the tunes are familiar and the Isleys’ vocal and guitar work is outstanding as always. As is the work of their backing band. The Wikipedia entry on this album rather curiously casts the Isleys’ decision to cover tunes by Bob Dylan, James Taylor and Crosby, Stills, Nash and Young as a black/white thing. As in, white guys are covering our tunes, so we’re covering theirs. Could be, but I’m skeptical. However, Mojo’s Andrew Male said last month that the Isley Brothers “give masterclasses in the art of the soul cover of the white pop hit” on this album. Most of his comments, however, are directed toward Side 1. In any case, enjoy Side 2, with covers of tunes by Eric Burdon and War, Bill Withers and Stephen Stills. Withers plays lead guitar on his “Cold Bologna” with Ernie Isley on rhythm guitar. “Spill the Wine,” “Nothing To Do But Today,” “Cold Bologna” and “Love the One You’re With,” the Isley Brothers, from “Givin’ It Back,” 1971. It runs 16:35.